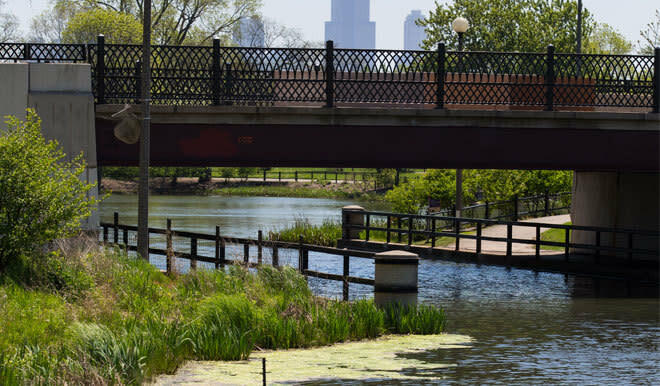 Humboldt Park is one of three parks established in 1869 with the West Park Commission. Originally landscaped by William Le Baron Jenney and later re-designed by renowned prairie landscape architect Jens Jensen, the park features various lagoons connected by a prairie river, a formal garden guarded by two buffalos designed by Edward Kemeys originally cast for the 1893 World Columbia Exposition and recast in bronze in 1911 as well as ball fields, soccer fields and stunning architecture. Not to be missed are the 1928 Fieldhouse designed by Michaelsen & Rognstad, the 1907 Boat House designed by Schmidt, Garden & Martin, and the restored Stables from 1896 which is now the Institute of Puerto Rican Arts & Culture.